This is absolutely hilarious. The name of the project “Read!” is a translation of the German “Lies!” Aptly named, considering they've edited out many of the Jihad verses in the Qur'an's they're handing out. 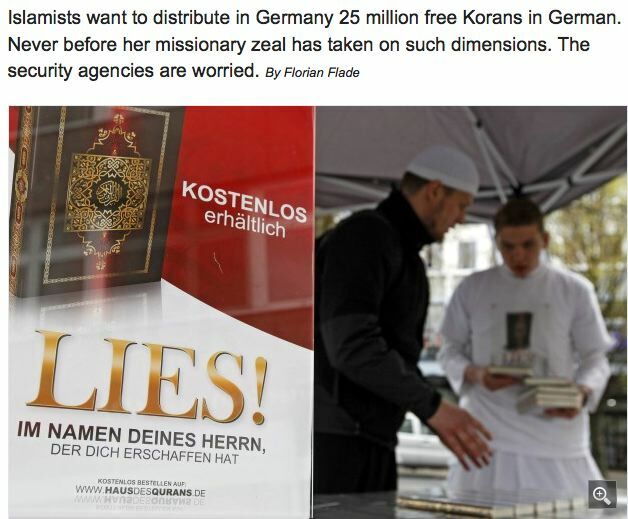 The mass proselytization campaign — called Project “Read!” – is being organized by dozens of Islamic Salafist groups located in cities and towns throughout Germany, as well as in Austria and in Switzerland. The campaign to place a Koran in every German household is being spearheaded by a Rheinland-based Salafist, Ibrahim Abou-Nagie, a Palestinian preacher of hate, who leads a radical Islamic group called “The True Religion” (“Die Wahre Religion”).